Jilbabmall.com DOES NOT warrant the performance or integrity of any product, but merely passes-through to the customer whatever end-user warranty the manufacturers, distributors publishers provide with their respective products. Our customers are entitled to the manufacturer's limited express warranty, if any, that accompanies the product. 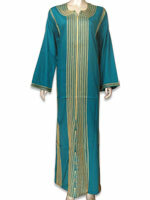 Jilbabmall.com makes no additional or independent warranty. All other warranties, express or implied, including the warranties of merchantability and fitness for a particular purpose are disclaimed. If by chance you receive a product that is defective, the manufacturer's warranty information will be clearly marked on or in the package you receive. If your product is damaged in shipping, the issue can quickly be resolved by notifying the shipping company. If you ever have questions not answered, please do not hesitate to contact us. information and other new services from JilbabMall.com.